SECDEF Gates Loses Intelligence-Gathering Opportunity? With the (then) upcoming North Korean missile launch, I had settled on the idea that the U.S. would shoot the missile out of the sky. This position quickly evaporated into one of watching Japan shoot the missile out of the sky. With some thought, I landed on the notion that Japan doesn’t have reliable enough systems to ensure success, and so attempt and failure would no doubt be an intelligence boon for North Korea. No, over time my position evolved to one of no attempt at a shoot-down, just high quality intelligence-gathering. We’d pull a Sun Tzu on them – they wouldn’t get to see our capabilities, but we’d see all of theirs. If they’re willing to show us their capabilities, then we should collect data – and lot’s of it. It was the most sensible position to take, and I was sure that the Pentagon would follow this line of thinking. There are several potential reasons for this decision that have been floated. Obama administration civilian policymakers accepted North Korea’s claim that the rocket spotted by intelligence satellites being fueled at North Korea’s Musudan launch complex was a space launcher with a satellite, and not a missile, the official said. He spoke only on the condition of anonymity because he was discussing internal deliberations. In the end, the missile failed to put a satellite into orbit, although the missile traveled farther than in previous North Korean tests. Former defense officials said the failure to use the SBX precluded the U.S. from gathering finely detailed intelligence and electronic signatures on the North Korean missile – information that could be useful in guarding against a future rocket launch aimed at the United States or one its allies. Regardless of whether it was a missile or space launcher, “the technologies that overlap between a ballistic missile and a space launcher are incredible; everything you need for a ballistic missile can be tested out with a space launcher,” one of the former defense officials said, speaking only on the condition of anonymity because the information he possesses about the SBX’s capabilities is not public. The first potential justification for this decision is that it would be seen as provocative. We’ll come back to that in a moment. The second potential justification is that the technology was associated with a satellite launch. This is of course irrelevant, since the North Koreans are attempting to perfect missile technology, whether the technology is used for satellites or warheads. The Obama administration had no chance of this justification passing muster, since the launch was a test. The circumstances surrounding the test have nothing whatsoever to do with how the technology might be used in the future. Let’s continue with the next excuse. The SBX radar, built on a large floating oil rig platform and normally based at the remote western Aleutian island of Adak, about 1,200 miles southwest of Anchorage, was undergoing maintenance in Hawaii in early March. “As it became more clear that this was a space launch attempt and SBX would not have added any to the capabilities we needed to monitor a space launch, we canceled our request to allow refit to continue on timeline,” the senior official said. Nice try, but again, that dog won’t hunt. One cannot say ahead of time what data might be required after the fact to properly assess performance. Ask any test engineer how precise he would like the test data, and you’ll get the answer “as precise as we can get it” every time. This senior official has offered an uncompelling excuse for utilizing what is arguably the most suitable technology for the situation. If not now, then when would the technology be used? Finally, the worst excuse floats to the top. Philip Coyle, a former Pentagon weapons testing specialist who has been critical of missile defense testing, said the SBX is technically a better radar than any system in Japan. However, Mr. Coyle said one problem with the radar is that its resolution is so fine it needs to be “cued,” or directed where to look. That may be a reason it was not deployed, he said. “Both the [Government Accountability Office] and my former office have questioned whether this radar can survive the maritime environment,” said Mr. Coyle, now with the Center for Defense Information. Oh good grief. They should have stopped with just poor instead of ending up with ridiculous. Now they look like they’re just making stuff up. If you want to know if the system can “survive the maritime environment,” just ask the weapons design and testing engineers. The GAO won’t know something that they don’t. If the engineers don’t know, then this presents yet another unmatched opportunity to test our own systems real time and in a live environment. Who knows when the North Koreans will launch another missile? In short, the most plausible reason for this decision is the first, i.e., that a huge floating radar system would have been “provocative.” Thus we’ve missed a once in a blue moon opportunity for valuable intelligence-gathering. Whether Gates supported this decision behind closed doors is not known. But one is left to wonder, would he have made the same decision while working for the previous administration? Secretary of Defense Robert M. Gates delivered a benchmark speech today and unveiled sweeping changes in both the weapons systems being pursued and the budgetary process. But the plans aren’t simply a numbers game according to Gates. There are so many commentaries on Gates’ decisions that I cannot possibly hope to cover and comment on all of his proposals. However, a few important observations follow. First, while I don’t celebrate the demise of the defense industry like some commentators, even when they are shown to be inefficient, the Army Future Combat System (FCS) was doomed to failure and properly so. The whole notion of field robots, unmanned ground vehicles, connectivity and cyberwar from the soldier to the UAV, Soldier exoskeleton, and the like, is untenable in areas such as Afghanistan where there is rough terrain, limited electricity, dust, grunge and grime, and the continual risk of fouled and failed components or components which otherwise cannot function because of loss of battery power supply. The concept, while futuristic and exciting to some, doesn’t comport with the realities of the battle space. It would be better to see the Army (and for that matter, the Marine Corps) invest in a new generation of rifles which can be fired from the open-bolt or closed-bolt position and which isn’t susceptible to carbon blowback and fouling. Also as regular readers of The Captain’s Journal know, the reduction in battle space weight (due mainly to heavy SAPI plates in body armor carriers) is a worthy investment. Add to this the necessary ground logistics and troop movement equipment such as a new generation of helicopters or at least an expansion in the size of the Cavalry, and this all amounts to quite a significant but certainly worthy undertaking for the Army and Marines. Turning our warriors into cyborgs doesn’t compare to simply giving them lighter battle space weight and assured logistics with helicopters. There are disappointing aspects of the proposals, though. The Navy gets hammered, and focuses on littoral combat ships. We here at The Captain’s Journal are skeptical about the program, and have yet to see the strategic need for turning our focus off of the larger ships to smaller ones that, according to Marine Corps Commandant Conway, the Navy has said won’t be taken nearer than the horizon, or about 25 miles from shore. 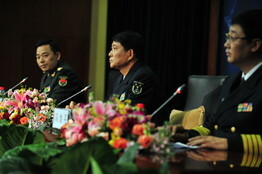 As for Aircraft carriers, it is as expected by Galrahn at Information Dissemination. It appears that the fleet is going to exist with 10 carriers for the foreseeable future. In my estimation this is a mistake and we should expand the carrier fleet by at least two (for a total of twelve). Again, consider the example of China. The Aircraft carrier is the prize towards which it pushes. China knows that true sea power will not be had until it can field an aircraft carrier. Besides, no matter how many littoral combat ships are fielded and no matter how many MEUs (Marine Expeditionary Units) are active at any one time aboard the USS Iwo Jima or the newer USS San Antonio or other docks, when hell starts raining down from the skies because we don’t control the air space above the Amphibious Assault Docks, Battalions of Marines will be sitting ducks and it will be too late to be concerned about deploying enough air power to protect our troops. Debates on the budget by the Congress and Secretary of Defense will be a long gone exigency in issues of life and death. And considering air power, we have already weighed in on the F-22. It is far superior to the F-35 and is simply needed in order to ensure air superiority into the future. Expensive, sure. But Gates is stopping at 187 F-22s, plus about four more. We probably need more. Concerning the refueling tanker, it will go out for bids again this summer. There is no need according to our own analysis. It should be unconscionable that we would award a contract for the refueling tanker to a company that is majority owned by Vladimir Putin. We should sole source it. One final note. As best as I can determine, the Marine Expeditionary Fighting Vehicle has gotten out unscathed. We have been hard on the EFV. Due in part to an effort to show the recent success of the program, the EFV might be looking better. It is, after all, the only vehicle that even proposes to be capable of forcible entry as a sea-based force. But since it has been given a reprieve, it had better perform. No more cost overruns, no more maintenance failures, no more design flaws. But if the lack of a V-hull for IED protection comes back to haunt us, let it be known that The Captain’s Journal has issued the warning. Overall, The Captain’s Journal rates the budget proposal as a mixed bag. Again, it’s simply too bad that trillions of dollars are being thrown away on things that won’t help our ailing economy, while the Soldiers’ and Marines’ salaries, weapons and gear have to suffer. One has to consider the possibility that it is immoral to ask our warriors to sacrifice even more when the executives are being bailed out and banks are being nationalized. In the January / February 2009 issue of Foreign Affairs, Secretary of Defense Robert M. Gates has a paper entitled A Balanced Strategy: Reprogramming the Pentagon for a New Age. It is a lengthy paper, and some selected quotes are extracted below, followed by a brief analysis. The defining principle of the Pentagon’s new National Defense Strategy is balance. The United States cannot expect to eliminate national security risks through higher defense budgets, to do everything and buy everything. The Department of Defense must set priorities and consider inescapable tradeoffs and opportunity costs. The strategy strives for balance in three areas: between trying to prevail in current conflicts and preparing for other contingencies, between institutionalizing capabilities such as counterinsurgency and foreign military assistance and maintaining the United States’ existing conventional and strategic technological edge against other military forces, and between retaining those cultural traits that have made the U.S. armed forces successful and shedding those that hamper their ability to do what needs to be done. The United States’ ability to deal with future threats will depend on its performance in current conflicts. To be blunt, to fail — or to be seen to fail — in either Iraq or Afghanistan would be a disastrous blow to U.S. credibility, both among friends and allies and among potential adversaries. It would be irresponsible not to think about and prepare for the future, and the overwhelming majority of people in the Pentagon, the services, and the defense industry do just that. But we must not be so preoccupied with preparing for future conventional and strategic conflicts that we neglect to provide all the capabilities necessary to fight and win conflicts such as those the United States is in today. Support for conventional modernization programs is deeply embedded in the Defense Department’s budget, in its bureaucracy, in the defense industry, and in Congress. My fundamental concern is that there is not commensurate institutional support — including in the Pentagon — for the capabilities needed to win today’s wars and some of their likely successors. The recent past vividly demonstrated the consequences of failing to address adequately the dangers posed by insurgencies and failing states. Terrorist networks can find sanctuary within the borders of a weak nation and strength within the chaos of social breakdown. A nuclear-armed state could collapse into chaos and criminality. The most likely catastrophic threats to the U.S. homeland — for example, that of a U.S. city being poisoned or reduced to rubble by a terrorist attack — are more likely to emanate from failing states than from aggressor states. The kinds of capabilities needed to deal with these scenarios cannot be considered exotic distractions or temporary diversions. The United States does not have the luxury of opting out because these scenarios do not conform to preferred notions of the American way of war. Yet even with a better-funded State Department and U.S. Agency for International Development, future military commanders will not be able to rid themselves of the tasks of maintaining security and stability. To truly achieve victory as Clausewitz defined it — to attain a political objective — the United States needs a military whose ability to kick down the door is matched by its ability to clean up the mess and even rebuild the house afterward. The United States cannot take its current dominance for granted and needs to invest in the programs, platforms, and personnel that will ensure that dominance’s persistence. But it is also important to keep some perspective. As much as the U.S. Navy has shrunk since the end of the Cold War, for example, in terms of tonnage, its battle fleet is still larger than the next 13 navies combined — and 11 of those 13 navies are U.S. allies or partners. Russian tanks and artillery may have crushed Georgia’s tiny military. But before the United States begins rearming for another Cold War, it must remember that what is driving Russia is a desire to exorcise past humiliation and dominate its “near abroad” — not an ideologically driven campaign to dominate the globe. As someone who used to prepare estimates of Soviet military strength for several presidents, I can say that Russia’s conventional military, although vastly improved since its nadir in the late 1990s, remains a shadow of its Soviet predecessor. And adverse demographic trends in Russia will likely keep those conventional forces in check. 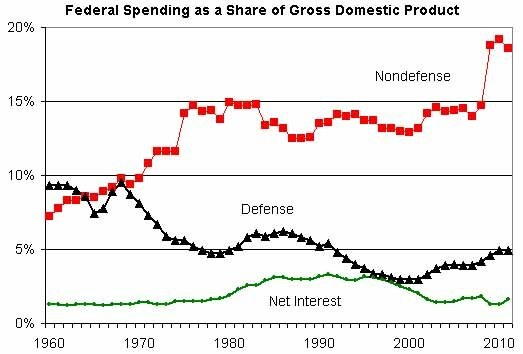 All told, the 2008 National Defense Strategy concludes that although U.S. predominance in conventional warfare is not unchallenged, it is sustainable for the medium term given current trends. It is true that the United States would be hard-pressed to fight a major conventional ground war elsewhere on short notice, but as I have asked before, where on earth would we do that? U.S. air and sea forces have ample untapped striking power should the need arise to deter or punish aggression — whether on the Korean Peninsula, in the Persian Gulf, or across the Taiwan Strait. So although current strategy knowingly assumes some additional risk in this area, that risk is a prudent and manageable one. 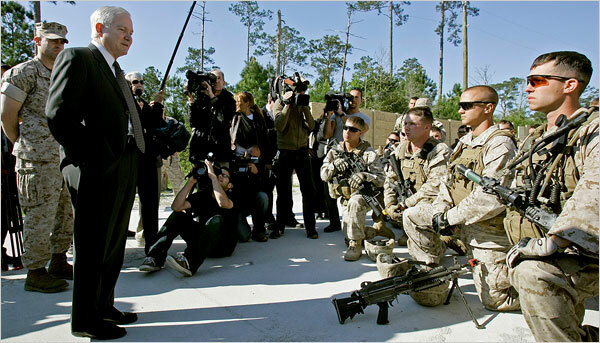 The entire paper is worth studying, but Secretary Gates continues to build upon the theme of maintaining a balance between arming and training for near peer conflicts and irregular warfare. The theme is in keeping with his history, as he has convinced the current administration that the 183 F-22s already purchased are enough to fill the gap between now and the advent of the F-35 (which by all accounts is far outperformed by the F-22). The Air Force wants more, but will likely have to settle for 183. Gates’ pragmatic view is also in keeping with our own advocacy of the A-10 (which we believe to have been prematurely retired and entirely capable of performing another decade or two), but our advocacy is not entirely based on its performance in COIN. It is also a very capable tank killer, and can still function as originally designed. Not every aerial weapon has to be new, and outfitting the A-10 to bring it up to the digital age is quite enough for now. Gates even goes to lengths that The Captain’s Journal isn’t prepared to go, in allowing money for the ill-conceived and (soon-to-be) ill-fated Army future combat system with its exoskeleton. We’ve made our desires know, i.e., lighter ESAPI plates with the same ballistic stopping power are a worthy investment, the exoskeleton is not (and is suited merely for erasing gender, strength and fitness differences in combat, not a laudable goal anyway). Kill the program, Secretary Gates. Gates also pushes the notion that investment in almost-failed states is a worthy goal compared to the risk, i.e., the next attack that levels a city or kills civilians is more likely than not going to come from almost-failed states rather than stable ones. So far, so good. The Captain’s Journal has always been an advocate for Secretary Gates and will be so into the future. But one cannot escape the sinking feeling that Gates is on another level in his understanding of things compared to the team that will surround him (excluding General Jim Jones). Gates clearly delineates between the army of State Department employees, foreign operatives and NGOs that are necessary for the proper engagement of almost-failed states and such notions for large state actors. The delineation is that while Gates works hard on the former, he doesn’t mention the later. The incoming administration appears by all accounts to believe that negotiations will suffice to dissuade bad state actors from their intentions. We have gone on record disagreeing with this. One cannot escape the reality that Russia just might push for some version of its former global empire, that China might just decide that it has lost patience with Taiwan, and that Iran, no matter the size of the army of negotiators, will continue its push for nuclear weapons grade material. At some point we must consider that in addition to the ground troops in Iraq and Afghanistan, it’s prudent to have fleets in the Persian Gulf and Gulf of Aden along with Marines for CENTCOM ready reserve. It’s going to be a difficult four years, we believe, but we feel certain about one thing. President-elect Obama couldn’t do any better than Secretary Gates, and his team is stronger for having him there, and would be profoundly weak without him. For those who have opined that the U.S. military is losing focus on conventional warfare with the institutional focus on counterinsurgency and stability operations, the argument is settled for the moment. We’ll do both, but we’ll focus for now on the campaigns we have at hand. And that’s that.